Midnyte Reader: The Bone Season. Title/Author: The Bone Season (The Bone Season #1) by Samantha Shannon. 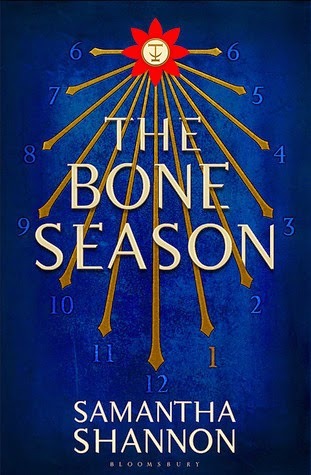 Midnyte Musings: I really didn't know what to expect from The Bone Season. I picked it up at the library without ever hearing about it or the hype that went with it. I can understand the excitement over it. It is a unique, creative and lovely story. The world building is dynamic as Shannon tackles a re-written history starting from the early 20th Century which includes supernatural abilities and a Dystopian society. However, not all is at it seems. Main character Paige Mahoney starts off by working for an underground criminal citadel utilizing her own unique talent, dreamwalking, which means she can infiltrate other people's dreamscape. She is useful and important to her crime lord and is just trying to keep her head low and avoid trouble. One day, she gets kidnapped and taken to a community long since believed to be defunct where she is basically a slave to an alien race of humanlike beings with more power than she can imagine. She is forced to make difficult decisions. She can succumb to her new life or she can die. But perhaps there is another choice. With the subtle help of her Warden, Octorus the alien who takes her into his home and trains her for work, she realizes that maybe there is another choice. Fight back. Paige is an amazing character. We get to know her by her actions, her memories and her choices. She is street smart and brave. Sometimes more reckless than is good for her. As an Irish girl growing up in England, life was difficult for her until she found her niche in the underground crime syndicate. I also loved Nick, who Paige is in love with and misses terribly. He is so kind and it is obvious that he cares about Paige, but I do not want to spoil any of the love story so that is all I will reveal. Warden, the alien who "claimed" Paige is a very interesting character. It is hard to know his true intentions and even Paige can't always figure them out. In time, Paige and Warden build a trust in a world where it is hard to trust anyone. The villainess, Nashira is quite horrific and relentless in her quest to get what she wants and ruthless when she is crossed. There is a lot of information in The Bone Season, names, slang, terms. But it wasn't difficult for me to follow as it flowed within the context of the story. I also found the writing lovely with snatches of gorgeous descriptions such as "...a smirk of a moon in the sky." The only issue I had was sometimes I found myself hard pressed to imagine the details of the world and exactly where the characters were in the story. Narration: Alana Kerr has the most beautiful voice I've ever heard in my entire life. Period. Not only that, the way she performed this book was perfection. Utilizing a melancholy tone that seemed to fit Paige, she brought the character to life with a slight Irish brogue, with heartfelt prose and realistic dialogue. I felt Paige's turmoil, her sadness and despair. I also felt her defiance. It wasn't just Paige's voice Kerr did well, it was the whole book of characters done to perfection, in all accents and both genders. Starstruck Over: I was charmed from the beginning by the lovely writing and narration. I loved this one, too! The Mime Order cannot come out quickly enough for me, and even if I am lucky enough to somehow get an ARC (doubtful), I'd still buy and listen to the audiobook. Alana Kerr has one of the best narrating voices. New York Ramblings - Wet Specimens. Script Magic - Guest Post by Erica Nunes.